I feel like I just recently went to Guu in Richmond, but come to think of it, it was actually a month ago. J and I wanted some Japanese food though, so off we went. It was a Thursday night and the place was pretty empty. The vibe and ambiance was totally missing, although they still screamed Japanese words at you when you enter and leave! Since there weren’t many customers, the service was especially tentative, and I feel like our tea cups were always full. Within minutes of taking down our order, we were given a complimentary appetizer. It was a Salmon Skin Salad, and although I usually don’t like to eat salmon skin, this one was not bad. 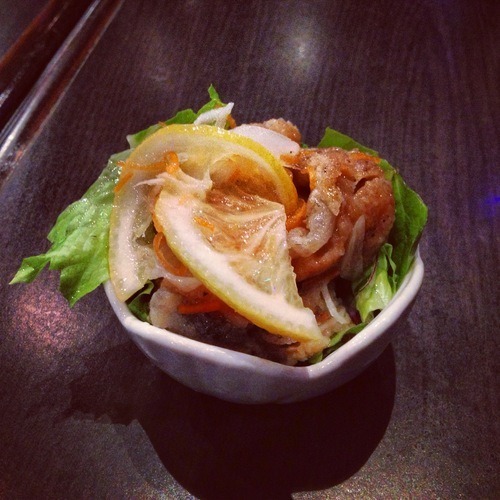 The lemon gave it some zesty flavours, and worked well with the rest of the salad. 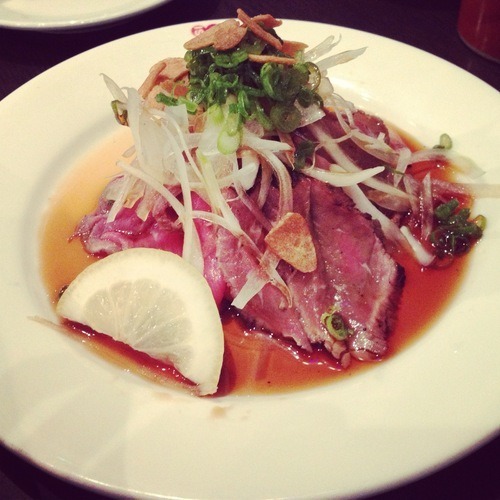 I chose to get the Beef Tataki, since I love the way Guu flavours it. However, I was extremely disappointed with tonight’s! Beef tataki is supposed to be seared, but this one was overdone. It still looks red on the picture, but I should have taken a snapshot of the other side, because it was completely cooked and brown. J and I both agreed this was not up to their usual standards. 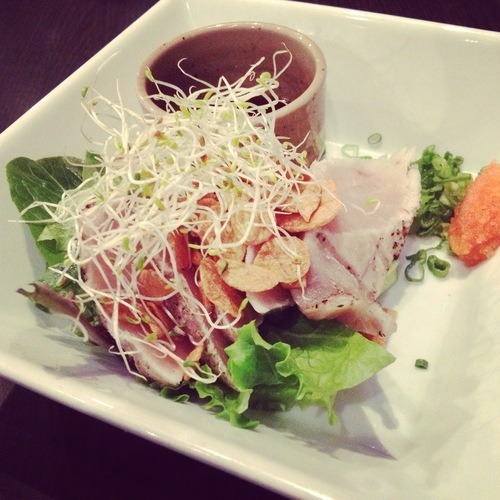 The Tuna Tataki was also a disappointment. It seemed like the chefs weren’t making their tatakis correctly tonight!! They are usually really delicious, so I’m not sure what went wrong, especially since they had plenty of time to perfect it since there were barely any customers. Somehow, we ended up with Steamed Mussels too! We didn’t order them, but I took a picture of them before we told them to send them back. 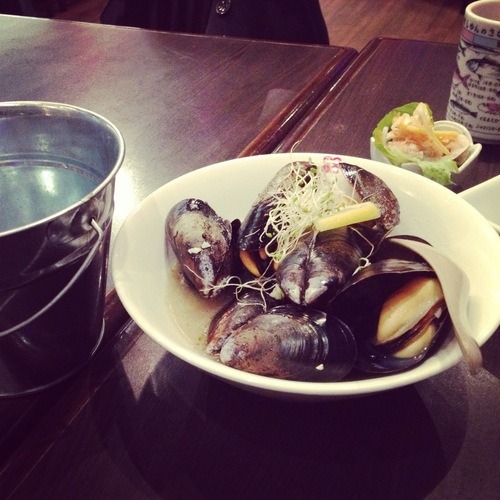 They looked delicious though, and we were tempted to eat them anyways…The mussels looked fatty! J wanted to get something like a unagi don, so the waitress recommended us the Unagi Moshi. It’s colourful and comes in a stone bowl. 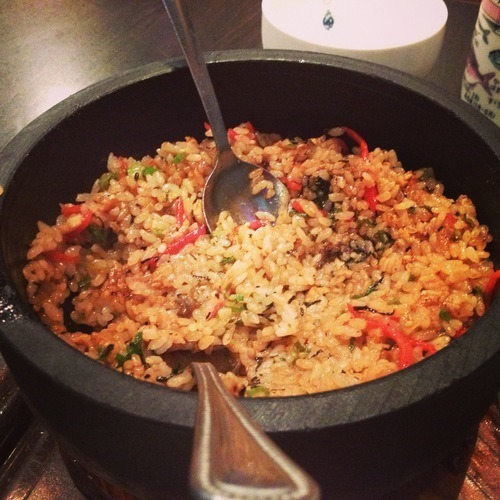 It totally reminded me of a bimbimbap! The waitress then helped us mix it all together. I’m not a big fan of eel, but I liked how the bits were all mixed into the rice, so you could still taste the eel, but the texture wasn’t as apparent. It was strong in ginger flavours, and the teriyaki sauce worked well with everything. 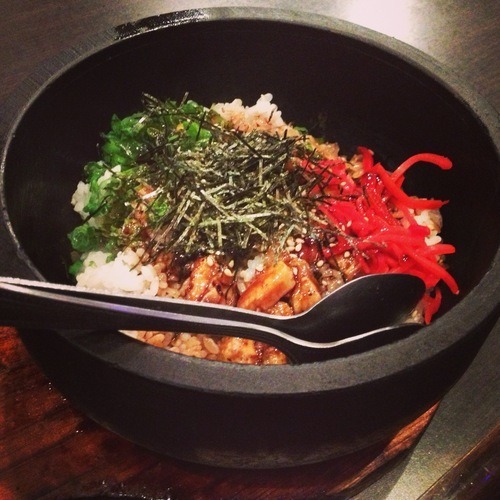 At the bottom, the rice started to dry up, and you could get the crunchy rice texture just like in any stone bowls. 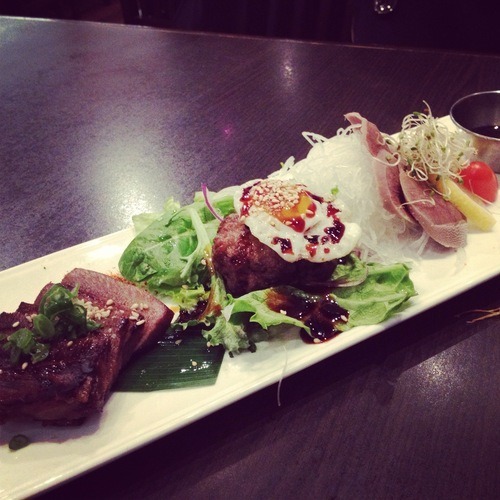 Finally, J wanted to try something interesting, so we got the Beef Tongue which was prepared in 3 different ways. I have to say I was hesistant to try it first, just because I get a little iffy when I try new organs, or weird body parts… Who doesn’t?! The first one on the right of the plate was cooked and chilled. We found that it was quite salty and reminded us of ham. The texture is definitely chewy though. The one in the middle confused us a little. It had a sunny-side-up egg on top and underneath was a meatball! It was a meatball with beef tongue in it. This is a good choice for starters who have not tried tongue before, since you wouldn’t even realize what’s in it. It’s literally like a meatball! The last one on the left was crispy on the outside, and wasn’t as salty as the first. It was flavourful and I liked it much more compared to the first. 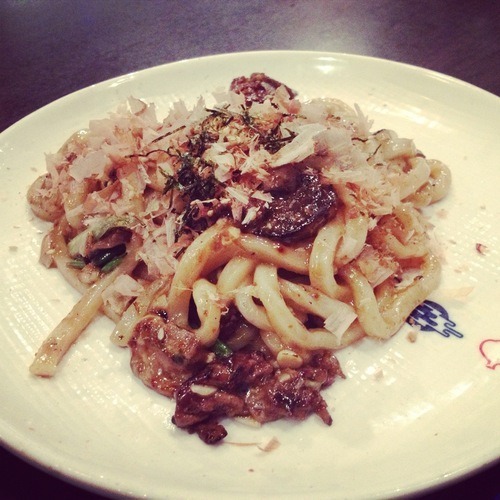 Overall, I was quite disappointed with my visit at Guu this time. I remember a friend saying that the Guu in Richmond is always either a hit or miss. Their consistency is a problem, but this was the first time I experienced this. Weird how it was a weekday and the chefs had plenty of time to perfect their dishes since there were few customers, yet they did not.